04/14/19 "Truth, Story To Tell, Talent" ADDED! NEWS Use the PayPal store on this site to lease any beats fully untagged! Contact SALES@EMOTIONLBEATS.COM for purchasing info. 10/07/12 3 New Free Beats *Rock Like, Soldier, Diamond Chains* ADDED! *NEW* Cry For Help *DEEP TUPAC TYPE* FREE DL! LIMITED TIME OFFER: ALL EXCLUSIVE RIGHTS ONLY $199 PER BEAT! CONTACT SALES@EMOTIONLBEATS.COM NOW! *NEW* First Night (Smooth #1 Hit!) FREE DL! *WOW* Victory (B.I.G. & TUPAC TYPE!) FREE DL! *NEW* Bobby V (SMOOTH #1 HIT!!!) Free D/L!!! *FREE BEAT* Lost & Found MOST EMOTIONAL BEAT 2012! (Your First #1 Major Hit!!!) 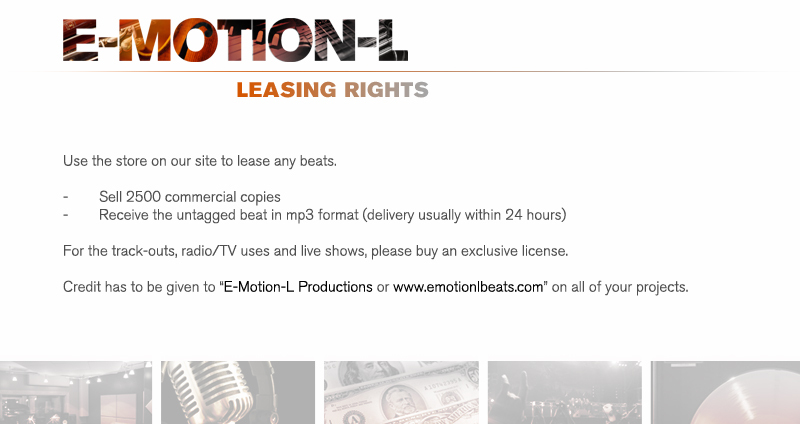 Contact sales@emotionlbeats.com to purchase leasing or exclusive rights to this amazing beat. Receive the full version with purchasing a lease through our site! One of my best productions. Intro written by E-Motion-L & Spoken by Kevin Eugene Boucher . Beat produced by E-Motion-L, Mr. Chakz, Doom Room Records & L-Wren. Contact sales@emotionlbeats.com to purchase. +MOST EMOTIONAL+ Beyond Our Dreams FREE DL 2017! WRITTEN BY E-MOTION-L, PERFORMED BY JOHN MICHAEL Use the PayPal BUY NOW button to lease the full untagged version with hook for $29.99. 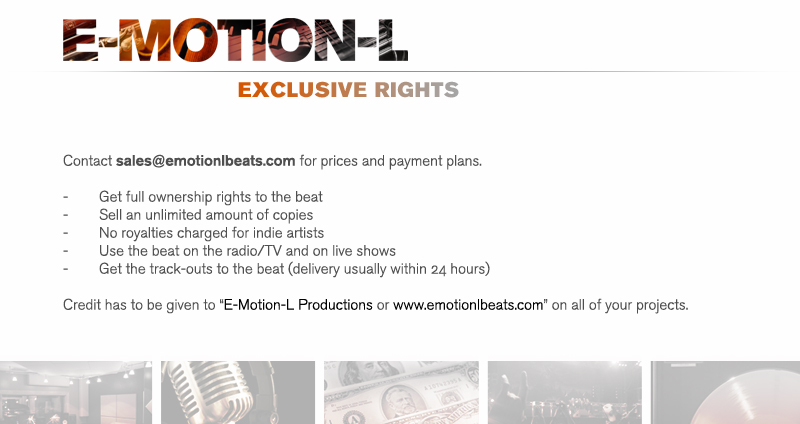 Contact sales@emotionlbeats.com for more info and exclusive rights. LYRICS: You can't fu*k with me, I got money to the ceiling, smoking weed, getting high, blow another million. 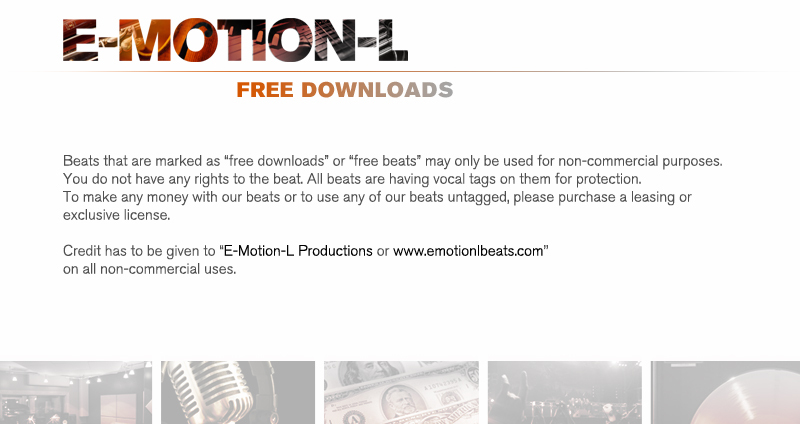 Contact sales@emotionlbeats.com to purchase leasing ($49.99) to this beat with the hook. We are now offering custom hooks and verses. NO EXCLUSIVES ON THIS BEAT! W/HOOK & BRIDGE! Be Loved /Amazing FREE DL Banger! *W/HOOK* Justice (STOP SHOOTING!) *W/HOOK* FREE!